Library cards are FREE, and you can use it as soon as you get it. Your library card will expire after 3 years. Just call toll free 1-866-779-7761 or drop in to your nearest library branch to renew your card. If you are under 14, you must have your parent or legal guardian sign your library card application form. Parents or guardians are responsible for all library materials a child under the age of 14 reads or views, including information on the internet. 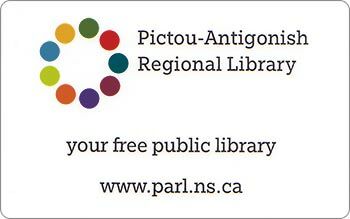 The Pictou-Antigonish Regional Library Board offers access to the Internet and has an Internet Agreement which states the rules & policies. You are responsible for any materials checked out on your card. Call us immediately if your card is lost (toll free 1-866-779-7761). Like most other cards, your library card comes with a PIN (Personal Identification Number). If you would like to change your PIN number you can call us, tell us your library card number, and we'll change your PIN or login to Your Account and change your PIN.